The Urban Renewal Authority (URA) became a white knight last week as it stepped in promptly after the Buildings Department declared four tenement blocks in Tokwawan are structurally dangerous and that owners of the buildings have to demolish their home within nine months. The authority announced on 17 December 2013 it would redevelop the four dangerous buildings. The decision saves those affected from paying for the building’s demolition and offers the owners cash compensation equivalent to the value of a seven-year-old flat. We don’t have the background of those affected, but given the place where they reside, it is reasonable to believe they are low-income families. Among the four blocks, one of them has been in public spotlight since July last year. The Buildings Department found dangerous structure in the balconies at number 51, Kai Ming Street. Government surveyors, therefore, ordered the residents evacuating from the building. Gripped by financial burden and uncertainty the evacuation order brings, those affected turn to the authority for assistance, hoping it would redevelop the dangerous building. The authority turned down their request to buy their homes. To save themselves from losing all they have, they joined the authority’s Demand-led scheme, under which the property owners have to secure 80 per cent of the property rights themselves within a period of time, if they can get it done, the authority will redevelop their building. If they fail to do so, it is not the authority’s business. It is difficult to understand why the authority is considered or perceived as a white knight in this case. “Addressing Hong Kong’s acute urban decay problem and improving the living conditions of residents in dilapidated urban areas” tops the authority’s commitments and is nailed on its website by itself. So stepping in a dangerous building, bailing out the poor people is what the authority should do. There is nothing noble here since it is simply doing what it always says it should be doing. Indeed, the authority is inconsistent with what it proclaims by making those poor people to go for the Demand-led scheme in the first place. Or if the authority is truly here to address urban decay and improve the people’s living condition, it actually owes this group of poor people and the people of Hong Kong an apology. It should have soul-searching on why it fails to detect the problem and stepped in early. It is the Building Department’s job on inspecting building conditions. But don’t forget, the authority has the database on the conditions of all buildings in Hong Kong. It is because the authority and the Building’s Department share and have access to the same set of database. Our press and public are very generous to the authority. Instead of taking the authority to task, they worry the move would open the floodgate for more owners of dilapidated buildings to ask for redevelopment. Think about it, if owners of such decay old blocks do not ask the authority to redevelop their building, the authority will have no projects to work on. It can be folded. Or the URA will have to go back to the old way, forced redevelopment in prime areas like Wedding Card Street in Wan Chai, make huge profits, and again made itself enemy of the community. Our press and public also expressed worries the authority will lose money in this particular project. How could this be possible? Although Tokwawan is not a business, or a fancy district, it is still in the urban area. The land is still metro land. Redeveloping four tenement blocks in the urban area is profit-making guaranteed business. The only uncertainly is how much profit it is going to make. It is unlikely the project will be as lucrative as the redevelopment of Wan Chai’s Lee Tung Street. Now The Avenue, jointly developed by Sino Land, Hopewell and the authority, is selling more than HK$23,000 per sq. ft. 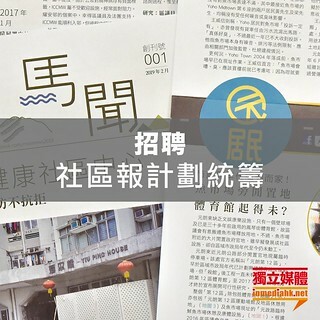 The purchasing price the authority paid to former residents of Lee Tung Street was only HK$4,000 per sq.ft. Our press and our public do not only generous to the authority, they are equally forgiving to its mishaps. The former chairman of the authority, Barry Cheung, who last Christmas used the press to pressure a small businessman to sell his property at Tai Kok Tsui at a price he disputed. Last Christmas, the small businessman was branded as a greedy person who profits on property speculation that his self-interest nearly tarnish the redevelopment dream of all his neighbours. This Christmas, the authority is described a white knight that put itself in an uncertain financial commitment to redevelop four tenement blocks. Most of us seems unable to learn from history: the URA will not take up projects that are not profit making.